몬테비데오 방문 시, 양질의 숙박과 훌륭한 서비스를 제공하는 본 숙소(호텔 알베어)에서 집과 같은 편안함을 느껴보시기 바랍니다. 이 곳에서 생동감 넘치는 도시의 많은 것을 최대로 즐길 수 있습니다. Fuente de los Candados, 시네마테카 우루구아야, 무세오 델 오토모빌 등에 가기도 편리합니다. 본 숙소(호텔 알베어)는 피곤하고 지친 여행자들을 기운 나게 하기 위한 우수한 서비스와 모든 필수 시설을 제공합니다. 본 숙소에서 24시간 룸서비스, Wi-Fi (무료/전 객실), Wi-Fi (공공 장소), 룸서비스, 패밀리룸등을 포함해 다양한 서비스를 이용할 수 있습니다. 본 숙소(호텔 알베어)에는 집같이 편안하고 안락한 총 47개의 객실이 있으며, 감각적으로 세련되게 꾸며진 많은 객실에서 평면 TV, 거실, 무선 인터넷, 월풀욕조, 에어컨 등을 이용할 수 있습니다. 본 숙소 투숙 기간 다양한 여가 시설 등을 이용할 수 있습니다. 본 숙소(호텔 알베어)는 몬테비데오행 여행객의 스마트한 선택이 될 수 있습니다. 바쁜 일상을 벗어나 매순간이 편안한 휴식이 될 것입니다. Loaction is right off 18. july where most bus lines drive. Very helpful staff. Breakfast was a little rudimentary and rooms were simple. Apparently prices vary greatly with demand. At the lower pricing level this hotel is a good option. Seems to be a popular place and heavily frequented with families. The hotel is quite dated - entering is a bit like stepping back into the 1970s. The lift in particular should be in the British Museum. But we quite liked the old fashioned style and the facilities - room size and cleanliness, breakfast - are quite acceptable. Location is excellent within 5 minutes walk of the main shopping street and the Plaza Independencia, 10 minutes to the Rambla and 15 to the port. We would stay again. The hotel room was fine, clean and tidy, ac worked well, tv etc. Hotel staff were helpful and friendly. The breakfast was good. There was some renovation work goig on during the daytime, but this would only be a tempory thing. The hotel was in the centre of town, I'm not sure I'd have discarded one of my backpack padlocks at the well, top of road though. There were plenty of reasonably priced restaurants close the hotel. Loads of shops. This was near the end of my stay in South America, there were plenty of places to buy souvenirs, shop around. Mercardo de los Artesanos a few bloks down was particularly good I thought. Montevideo is a very pleasant city, friendly people. There were plenty of places to change money, I even managed to change sterling into USD at a very good rate. I had arrived from Rio Grande, Brazil, wildlife enthusiasts, the stretch south to the border, Chui was very boggy/pampas, there were loads of birds and I saw a couple of large crocs. I really wanted to see capybara, and I did, quite a few, some right by the side of the road as large brown pig shaped rodents, some as large as a small dustbin. There were a few remaining rheas, it was the weekend, the colourful local gauchos were holding a meeting. I departed for Argentina using the ferry, two sailings per day. Tickets in the docks, a restricted area, ther was a chunk of the battle ship Graf Spee that had presumably been salvaged. The fierce gun battle between the German and British parties was well explained. 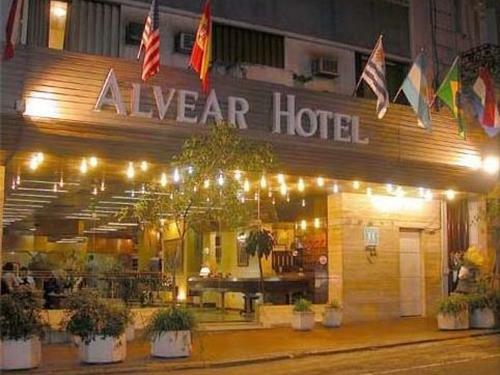 This was a very pleasant hotel and a very pleasant couple of days I had in Montevideo too. I got a good low rate when booking this hotel and I found the accommodation was much beyond it's value. The hotel lobby looked traditional and not fancy while the reception desk looked like an office in old times. But the room decor was comfortable while linen and bathroom were spotless clean. TV channel included BBC. Breakfast was good with varies type of fruits. Friendly people at the reception. Great place, location, staff, breakfast and service. very clean. i spent 3 nights and 2 days on this hotel. the relation between price - quality was quite well. the hotel it´s old fashion with and intention of refresh looks that´s make it very kitsch. the place it´s clean and comfortable, the hotel staff are very kind and helpful, and the room was a little small but cozy, the room had "frigobar", tv, a desk and the most important a good bed and comfortable pillows. the locations it´s really good if you like to walk. there are about 7 blocks for the most important tourist places and offcorse all the bus stop are 1 block down. for all that reasons i thinks that this is a great place to spent your weekend on montevideo. excellent services,very nice people,perfrect location , close to restaurant, shoppings and 18 julio ave.
we were on a budget so booked the cheapest hotel we could find, which was this one. it's very run down and in need of renovation. i reckon it hadn't been renovated since the 70's. there was bits of carpet missing, lights hanging off the walls. the walls were desperately in need of a paint. however, it is central and clean enough, although nobody made up our room while we were there. the breakfast was also ok.
alles okay, am Frühstück sollte man was ändern. Sehr freundliches Personal, der o.a. Nachtportier bei meiner Ankunft nach Mitternacht wäre ob seiner Freundlichkeit schon den Aufenthalt wert... Direkt in einer Seitenstrasse einer der Hauptavenidas gelegen, problematisch können sich für etwas ängstliche Gemüter die nächstens gegenüber dem Hotel rumlungernde Gestalten, die sich vom Alkoholangebot des 24h Supermarktes an der Ecke angezogen fühlen, erweisen. Zentral an der 18. Julio gelegenes Hotel, mit super freundlichem und hilfsbereitem Personal. Wir kommen seit Jahren immer wieder in dieses Hotel, wenn wir in Montevideo sind.